Absolutely no modifications can take place as manas does not meet memory patterns and incoming impulses do not flow in the central passage over the top of the brain. Essence of consciousness now has a link with Consciousness through bindu. (7) , A -- Ajna (magnetic point) : Upon reaching this centre, prana does not flow out of the system. It is routed via 7-->8-->9 and down the sushumna to muladhara, forming a closed circuit in which the speed of circulation of prana increases until it reaches 3600 cycles per 60 pulse beats (or 60 seconds). II. Mid Brain : fully evolved and functional. All three super micro transmitting monitors keep pulsating and transmitting for the corresponding permanent seed atoms in the causal body to register. IIIb. Memory pool deep : for memory brought over from previous lives. Both memory pools are effectively bypassed; consequently sattvic manas and the thinking instrument are not made use of. (0) , T -- Taluka : the block $\otimes$ here is closed to manas, i.e. incoming impulses, which in relation to the astral body are various grades of prana. The closed block $\otimes$ at taluka prevents the flow of manas over the memory patterns as well as through the central brain passage. So no modifications of mind can take place, unlike in stage 3a. The block O at the lower end of sushumna is open and prana flows through the central passage of the spinal column. 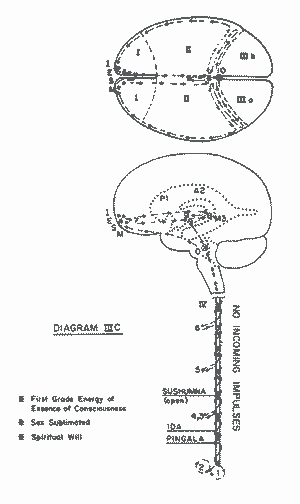 Here in stage 3c, the movement of prana from centre to counter-centre in the mid-brain, 7-->8-->9, is different from that in stage 3b, 9-->8-->7. Stage 3b was intuitional; stage 3c is transcendental! It is a prolonged non-sensory stage. Nor does prana flow out from ajna as in the diagrams of the previous stages -- it returns to (1<-->2) to form a closed circuit. The increase in the speed of revolution around this circuit creates `take-off' stage speed. `Take-off' force sufficient to send the primary body out of the physical body is 60 cycles in 60 pulse beats in pratyahara stage, 600 cycles per 60 pulse beats in dharna stage, 1800 cycles per 60 pulse beats in dhyana stage, and 3600 cycles per 60 pulse beats in samadhi stage. In dharna and dhyana stages, one can take leave to die consciously and be born again consciously; in samadhi, one can reach from samadhi with seed to samadhi without seed and in either samadhi stage take final leave from all physical births.